The pathology and treatment of diseases of the skin. London : Robert Hardwicke, 1872. Description, 2nd ed. : v p., [2 l.] p., -358 p., [4 l.] pl. ; ill.: 4 phots. (col.), ; 23 cm. 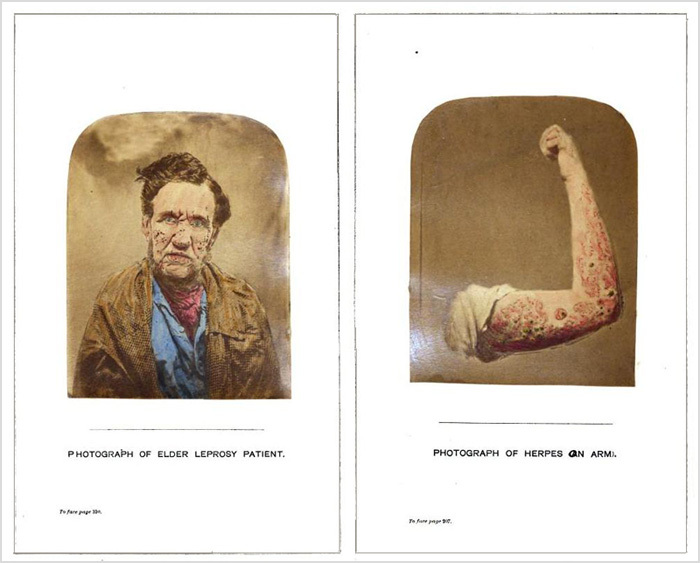 Photograph : 4 mounted albumens, hand colored, clinical portraits of skin disease. Subject : Skin — Dermatoses. Author caption: By John Laws Milton, Senior surgeon to St. John's hospital for diseases of the skin; Corresponding member of the New York Dermatological Society, etc. Qualified, Royal College of Surgeons, 1843. Founder, St. John's Hospital, 1863. First definitive description of pemphigoid gestationis, 1872. GM-4070: first observation of "giant urticaria" (angioneurotic edema, Quinke's disease), 1876-77. First edition published by Hardwicke in 1865 (not illustrated). First edition title: On the modern treatment of some diseases of the skin. Third edition published in 1890. Photo caption: Prurigo in a boy. Supposed instance of the prurigo of Hebra. Photo caption: Photograph of herpes on arm. Photo caption: Photograph of younger leprosy patient. Photo caption: Photograph of elder leprosy patient. The delicately painted photograph, above, shows the infected arm of a gravid 45 year-old woman, identified only as "Jane S.," an out-patient for three months in 1867 at St. John's Hospital for diseases of the skin. This was her eighth pregnancy and the third pregnancy complicated by the disease, each episode more virulent than the last. Milton credits Erasmus Wilson (1809–1884) with the first published report of the skin disorder, having named it "herpes circinatus bullosus" in the sixth edition of his textbook, On Diseases of the Skin (1868). However by naming it "herpes gestationis," Milton associated the lesions with pregnancy, and it is for this reason that some scholars credit him with the discovery of the dermatosis, now referred to as "gestational pemphigoid" — an autoimmune reaction that is unrelated to herpes. Milton was director of St. John's hospital, which he founded with the patronage of Lord Chesterfield. He exploited his position at the hospital to develop a large and lucrative practice treating a pseudopsychosis he termed, "spermatorrhea." To cure his male patients of their unwanted nocturnal emissions, he devised bizarre and painful penal collars, fitted with steel teeth.